The U.S.-U.A.E. Business Council hosted the U.S. Consul General to Dubai, Philip Frayne, for a private dinner and discussion with senior U.S. and U.A.E. business executives on Wednesday, September 5th in Dubai. Danny Sebright, President of the U.S.-U.A.E. Business Council, provided brief introductory remarks welcoming the new Consul General and asked member company representatives of the Executive Board to provide a brief overview of their business interests in Dubai and the overall business climate in the U.A.E. Mr. Frayne thanked the U.S.-U.A.E. Business Council for providing a unique platform through which public and private-sector leaders can discuss opportunities and challenges impacting the overall U.S.-U.A.E. commercial and trade relationship. Mr. Frayne also discussed his role as the new Consul General to Dubai and services he and his team can provide U.S. companies. Accompanying Consul General Frayne at the dinner were Political and Economic Chief Dayle Carden and Commercial Officer Shakir Farsakh. “I look forward to working with U.S. businesses in Dubai to help promote new opportunities for our companies, help solve problems, and encourage new partnerships with our Emirati hosts,” said the Consul General. After concluding his remarks, Mr. Frayne engaged the attendees on opportunities for American companies to participate in Expo 2020 Dubai and support the U.S. pavilion that will be built there. Conversation over dinner touched on a number of current developments in the Dubai and U.A.E. business ecosystems, and provided an opportunity to share views on various projections for the year ahead. U.S. Consulate General DubaiPhilip Frayne is the U.S. Consul General to Dubai. Mr. Frayne has been with the U.S. Department of State for 30 years, serving in Calcutta, Cairo (on two different assignments), Casablanca, Washington, Sana’a, Colombo, Amman, Baghdad, and Paris. 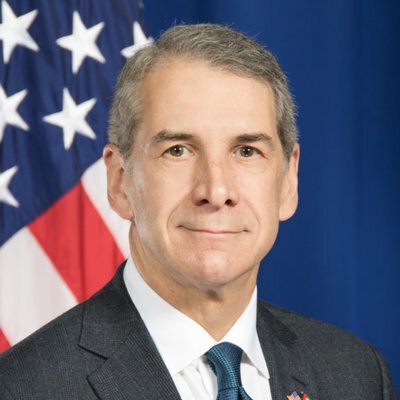 He has served predominantly in Public Diplomacy positions, most recently as the Minister-Counselor for Public Affairs at the U.S. Embassy in Paris. Mr. Frayne holds a BA degree in Comparative Literature from Columbia University and an MA in International Relations from Johns Hopkins SAIS. He speaks Arabic, French, and some Spanish. Mr. Frayne is originally from the suburbs of New York City.